Sometimes when we’re simply excited about something we interrupt people in a conversation – I know sometimes I do…this happened recently and I tapped on it this morning (EFT, Emotional Freedom Techniques) as I felt that “I should know better”. It happens…and we must keep our awareness-antennas up about that. Does being in the “hurry lifestyle” impact on doing this more? If you find yourself interrupting other’s sentences – not because you are consciously impatient, impulsive or impetuous – but simply feeling excited, you can tap on that daily as well as keeping a rubberband on your wrist to snap whenever it happens. It can be construed by the other as rude/inconsiderate or not paying attention/listening. Communicating Effectively at Home & Work = Great Relationships! How do you feel when an understanding friend quietly listens to you with love and sincere interest? This may be the polarity of how it felt when you were really upset about something, began to share, and the “listener” shut you off or interrupted to give you suggestions. A person who listens with loving interest and respect helps us process our emotions. When another accepts our emotions (without judgment) it has the effect of giving us permission to accept our own emotions and feeling empowered to process and resolve the issue. The ability to communicate ‘no’ really reflects that you are in the driver’s seat of your own life, and can give gives you a sense of empowerment. How to do it most effectively? A study in the Journal of Consumer Research by Professor Patrick and Henrik Hagtvedt found that saying “I don’t” as opposed to “I can’t” allowed participants to extract themselves from unwanted commitments. While “I can’t” sounds like an excuse that’s up for debate, “I don’t” implies you’ve established certain rules for yourself, suggesting conviction and stability and are more effective in getting your point across. There are a few other ways you can get more comfortable with saying no. It’s a lot easier to be assertive with a stranger selling you something than it is when, say, your pleading co-worker asks for a ride to the airport. Get comfortable with your assertiveness when it’s easy so you’ll be prepared when there’s more pressure. It’s easier to say no when you know exactly how to say it, so come up with a few anchor phrases for different situations. “No, I don’t buy from solicitors” for door-to-door salespeople, for example. “No, I don’t go out during the week” for co-workers who want to go on a drinking binge on a Monday night. When you have these phrases ready, you don’t have to waste time wavering over an excuse. And you start to develop a reflexive behavior of saying no. Still, sometimes we’re afraid to say no because we fear missing out. We want to take on new opportunities and adventures, so we say yes to everything instead. But all of those yeses can lead to burnout. It can help to understand your own long-term goals This way, you can say yes to opportunities that most reflect your values. Second, try to build free time in your schedule so there’s room for new, interesting opportunities you might otherwise overlook. Some worry that your no might seem threatening. Research from Columbia University found that our perceptions of our own assertiveness are often unreliable. In mock negotiations, people who thought they were adequately assertive or even over-assertive were seen by others as under-assertive. So if you feel confrontational, there’s a good chance the other party doesn’t see you that way. It’s about operating at the most optimal level. For most of us, that means living a happier and less stressful life, which is easier to do from the driver’s seat. 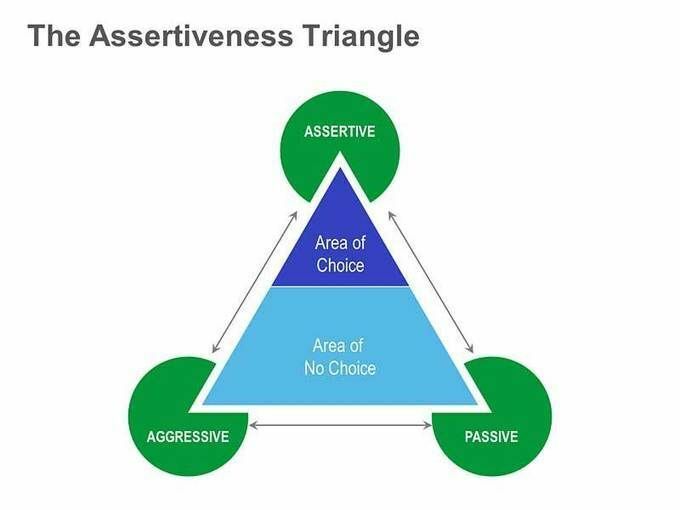 Being assertive is a core communication skill. Being assertive means that you express yourself effectively and stand up for your point of view, while also respecting the rights and beliefs of others. Being assertive can also help boost your self-esteem and earn others’ respect. Assertiveness can help you control stress and anger and improve coping skills. Do you need help learning assertive behavior and communication? The one most important piece of advice I have to give is this: Do not take something negative that someone says personally- it may be true – or perhaps it is simply the individual’s distorted perception. We are each quite capable of creative interpretations – of cognitive distortions. You may be asking- what exactly is that?? Cognitive distortions are exaggerated and irrational thoughts that can hold us back from our true potential. There are many recognized cognitive distortions that are helpful to be familiar with – so you can turn yourself around and also recognize when others are on that path. This is helpful in ‘not taking things personally,’ and puts you in the position to share your recognition of that with the one experiencing it. 1. All or Nothing Thinking: You see things in extreme, ‘black or white’ categories. If your performance falls short of 100% you see yourself as a total failure. Any mistake or imperfection is feared as being a loser! Example: Actor who considers a performance a disaster because of one critic. 2. Overgeneralization: You see a single negative event as a never-ending pattern of defeat. Example: You go for a job interview and don’t get the offer- you fear lifelong unemployment. Pain of rejection can easily lead to over generalization. 3. Mental Filter: You pick out a single negative detail and dwell on it exclusively, thus perceiving the whole situation as negative. Example: Student dwells on questions he missed even if he got a 90! 4. Disqualifying the Positive: You reject positive experiences by insisting they ‘don’t count’ for some reason or another. In this way, you can maintain a negative belief that is contradicted by your every day experiences. Example: You get a compliment- you turn around and say the person giving it isn’t sincere. 5. Jumping to Conclusions: You make a negative interpretation even without definite facts that convincingly support your conclusion. a. Mind Reading: You arbitrarily conclude that someone is reacting negatively to you, and you don’t bother to check this out. Example: You leave a message for someone who doesn’t return your call. You assume they don’t like you. b. Fortune Teller: Anticipation that things will turn out badly, and feeling convinced that the prediction is an already established fact. When you do this, you plan to fail. The opposite of this is positive attitude, seeing the glass at least ‘half full’. 6. Magnification or Minimization: You exaggerate the importance of things (such as your ‘goofup’ or someone else’s achievement) or you inappropriately shrink things until they appear tiny (your own desirable qualities or another’s imperfections). This is called the ‘binocular trick’. Examplemissing a question in medical school and thinking that you shouldn’t be a doctor! 8. ‘Should ‘ Statement: You try to motivate yourself with should and ‘shouldn’t as if you had to be punished before you could be expected to do anything. The same with ‘must’ and ‘ought’. The emotional consequence is guilt. When you direct. ‘should’ statements towards others you feel anger, resentment, frustration. Example: I should fill out my progress sheet for class vs. I want to fill out my progress sheet for class. 9. Labeling and Mislabeling: This is an extreme form of overgeneralization. Instead of describing an error, you attach a negative label to yourself: “I’m a loser.” When someone else’s behavior rubs you the wrong way, you attach a negative label to him/her: “He’s an idiot.” Mislabeling describes an event or person in ways that are emotionally loaded. 10. Personalization: You see yourself as the cause of some external negative event for which, in fact, you were not primarily responsible. 11. What If’s: You can become extremely anxious over the possibilities of what might happen of which you can’t control. We need to work on things we can do something about and not become a prisoner of what we cannot control. Healing suppressed wounds through Inner Child Work and Past Life Regression, How to Lift Mood with Food, Anger Management and It’s Ability to Improve Health, Emotional Freedom Technique, with a special emphasis on Weight Loss, Detoxing Naturally and Safely, Alleviating Seasonal Allergies with Homeopathy, Dream Therapy, Somatic Therapy for Deep and Profound Healing, the Importance of Whole Food Nutrition for the Brain and Body, How to Determine What Your Life’s Purpose is, and more!! The best predictor of a positive outcome is your willingness and intention to change patterns. Explore strategies to release anger, reduce stress and deal effectively with others. Anger and communication issues are highly affected by stress levels. Being happier is a wonderful by-product of communicating effectively! Learn about distinctions among communication styles and behavior so that you can communicate more effectively at work and at home, be listened to, and respected. Learn how not to “take things personally” and reduce stress / frustration! Stress release techniques to help you cope with “difficult” people are included in this interactive workshop. Your communication, anger and stress impacts your relationships, health, work life and financial situation. 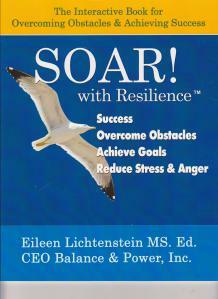 Inner strength and being centered are keys to life and business success, and Eileen Lichtenstein has specialized for over 20 years in personal development coaching and training, including stress and anger reduction/ management, relationship and leadership building, sensitivity training, communicating effectively and career issues. a very talented holistic network presents the following fascinating and important holistic health topics. This is a Port Washington Adult Ed course, Only 60 dollars for all 4 nights! Register Now: Click on the link, then click on Adult Enrichment, then on Health and Wellness. Please contact caroleitner1@gmail.com if you need any help with registration. Are You Speaking Your Truth? While it is important that we think before speaking, it’s important not to try to please everyone, which may cause us to hide or otherwise distort those ideas that will likely prove valuable. We may feel uncomfortable speaking our minds in this way because we believe that our quick-to-appear initial thoughts are yet unformed and can only be improved by careful consideration. In discounting them, however, we do ourselves a disservice. Give yourself the freedom – permission to speak your mind (within assertive guidelines) without being a people pleaser! Trusting initial thoughts and speaking your truth without too much refinement or rearranged words is often the best choice. There may be a fine line between thinking before speaking and being overly self-critical in analyzing thoughts into words. Give yourself credit for good communicative skills and intelligence! Always keep “in mind” and “be aware” of the general distinctions among assertive, passive and aggressive communication-behavior styles for your best communication! Eileen Lichtenstein, MS. Ed. 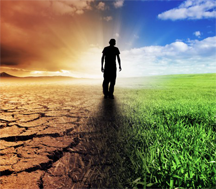 has specialized for 20 years in personal development coaching and training, including stress reduction management, communicating effectively and career issues. She helps women and men to access the power already within. She is a certified Anger management Specialist. Credit Cards accepted via telephone.